Below is a small sample of publications pertaining to the definition of “digital literacy.” These resources have been placed in a table with notes (see below) that can be searched and sorted. Note that the table has multiple pages; pagination links appear at the bottom of the page. Belshaw, Douglas A. J. “What Is ‘Digital Literacy’ A Pragmatic Investigation,” 2012. http://etheses.dur.ac.uk/3446/1/Ed.D._thesis_(FINAL_TO_UPLOAD).pdf. Dunn, Jeff. “The 8 Key Elements of Digital Literacy.” Edudemic: Connecting Education &Technology, May 19, 2014. http://www.edudemic.com/digital-literacy/. Furber, Steve. “Shut Down or Restart: The Way Forward for Computing in UK Schools.” Royal Academy of Engineering, January 2012. https://royalsociety.org/~/media/education/computing-in-schools/2012-01-12-computing-in-schools.pdf. Goodfellow, Robin. “Literacy, Literacies and the Digital in Higher Education.” Teaching in Higher Education 16, no. 1 (February 2011): 131–44. https://doi.org/10.1080/13562517.2011.544125. Hague, Cassie, and Sarah Payton. “Digital Literacy Across the Curriculum: A Futurelab Handbook.” National Foundation for Educational Research: Evidence for Excellence in Education, January 2010. https://www.nfer.ac.uk/publications/FUTL06. Hockly, Nicky. “Digital Literacies.” English Language Teaching Journal, Technology for the language teacher, 66, no. 1 (January 25, 2012): 108–12. Jacobsen, Trudi E., and Thomas P. Mackey. “Proposing a Metaliteracy Model to Redefine Information Literacy.” Communications in Information Literacy 7, no. 2 (2013): 84–90. jPodcaster. “Making Sense of the 8 Elements of Digital Literacy | Professionalism in the Digital Environment (PriDE).” Professionalism in the Digital Environment (PriDE), October 1, 2012. https://digilitpride.wordpress.com/2012/10/01/making-sense-of-the-8-elements-of-digital-literacy/. Knobel, Michele. Digital Literacies: Concepts, Policies and Practices. Peter Lang, 2008. New Media Consortium. “Digital Literacy in Higher Education, Part II: An NMC Horizon Project Strategic Brief,” August 2017. https://library.educause.edu/resources/2017/8/digital-literacy-in-higher-education-part-ii-an-nmc-horizon-project-strategic-brief. Ribble, Mike. “Nine Elements.” Digital Citizenship, 2017. http://digitalcitizenship.net/nine-elements.html. Trilling, Bernie, and Charles Fadel. 21st Century Skills: Learning for Life in Our Times. John Wiley & Sons, 2009. I need to make use of digital technologies in order to prepare myself to participate as fully as possible in society. I will develop an awareness of how my digital environment can help me self-organise and foster links with local, national and global organisations. I will look for opportunities for public engagement, global citizenship and the enhancement of democracy through my use of digital technologies." jPodcaster. (2012, October 1). Making sense of the 8 Elements of Digital Literacy | Professionalism in the Digital Environment (PriDE). 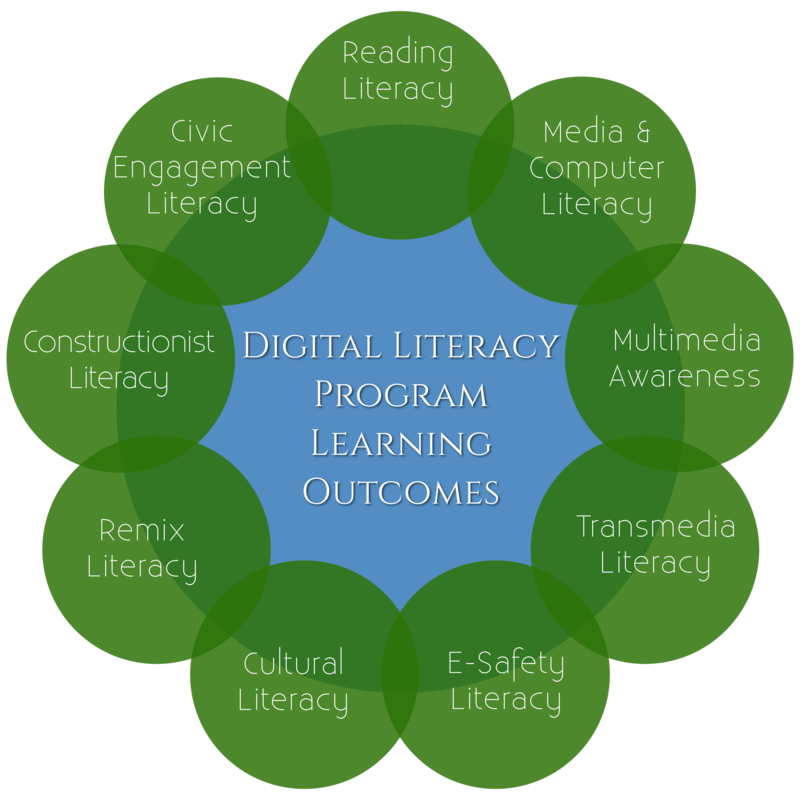 Retrieved February 12, 2017, from https://digilitpride.wordpress.com/2012/10/01/making-sense-of-the-8-elements-of-digital-literacy/. Beginning with the question: ‘what does the conjoining of expanded concepts of literacies and the digital, as ‘‘digital literacies’’ add to our understanding of teaching and learning’? I argued that, when applied to higher education it has revealed a tendency to sideline much of the cultural content of a social literacies framing. Although digital literacies are presented as indicative of educational and social capital in a technologised world, in practice the term tends to refer to the competences of individual learners, rather than to literacy practices that serve the interests of specific communities, such as the IT, library, study skills and academic disciplinary communities (139-140). This paper is a critical review of some recent literature around the ‘literacies of the digital’ in schools and higher education. It discusses the question: ‘what does the conjoining of the terms ‘‘digital’’ and ‘‘literacy’’ add to our understanding of teaching and learning in higher education’? It explores the continuing role of critical literacy in relation to the idea that digital literacies are transformative for pedagogy in this sector. • Creative applications such as digital photography, video editing, audio editing. We intend “digital literacy” to connote those skills that (say) a history teacher can assume his / her students have, just as s/he assumes they can spell (literacy) and do simple mental arithmetic (numeracy). Higher level information handling skills are part of Information Technology (21). These “underpinnings” refl ect the rather traditional skills, of which we may now need to regard computer literacy as one, which make up an older idea of literacy, and an ability to function in society. It seems an open question as to whether they should be regarded as a part of digital literacy (perhaps in its formulation as “smart working” or “basic skills”) or whether they should be assumed, before digital literacy is grafted on. This is the kind of knowledge that was assumed of any educated person, in the days when information came as books, newspapers and magazines, academic journals, professional reports, and not much else, and was largely accessed through physical print-on-paper libraries. Th e well-understood “publication chain”—from author to archivist, passing through editors, publishers, booksellers, librarians and the rest—lasted as a sensible concept well into the computer age. Now, it is largely meaningless, and there is no clear model to replace it. Nonetheless, attaining as good an understanding of what the new forms of information are, and where they fi t into the world of digital information, has to be an essential start in being digitally literate. These are the basic skills and competences, without which any claim to digital literacy has to be regarded skeptically. They are a remarkably wide set, and it would be sobering to try to assess to what degree they are possessed in the various countries of the world. These attitudes and perspectives are perhaps what make the link between the new concept of digital literacy, and an older idea of literacy, in vogue over two hundred years ago. It is not enough to have skills and competences, they must be grounded in some moral framework, strongly associated with being an educated, or as our ancestors would have said, a “lettered,” person. They are arguably the most diffi cult to teach or inculcate of all the components, but they come closest to living up to the meaning of information from “infomare”; the transforming, structuring force (28-29). Accessing, evaluating, applying, and managing information well, and using information sources appropriately and effectively, are just some of the skills that define 21st century digital literacy. Understanding how different types of media are used to communicate messages, how to choose from the many media choices now available, and how to create effective messages in a variety of media are also important (66-67). The Digital Literacy Task Force developed a definition of digital literacy that can be used across library types. It is distinct as it emphasizes both technical and cognitive skills. Based on this year’s research, that model holds up fairly well. The sequence of media to information to digital literacy continues to function across the current findings, with the first two embedded firmly within the third. The emphasis on learners as creators remains vital and future-oriented, if still unevenly adopted in the present. The skills explored in the prior report — office productivity tools; media capture, creation, and editing (images, audio, video); web skills (writing and searching); physical media skills (computer hardware, 3D printing); and emerging fields (VR, AR, MR) — remain in play (p. 13). The SOLO Taxonomy points to a way that we can integrate two elements of literacy that are often seen to be in tension. On the one hand, some conceive being ‘literate’ as having the necessary functional skills (this would be ‘Unistructural or ‘Multistructural), whilst others conceive of it as the complexities of meaning an individual can express (‘Relational’ or ‘Extended Abstract’). Literacy is a condition, not a threshold and, as such, involves a spectrum of development that the SOLO taxonomy can help us conceptualise (204-205). Metaliteracy empowers learners to participate in interactive information environments, equipped with the ability to continuously reflect, change, and contribute as critical thinkers.